NEW YORK–Oct. 22, 2018– Preschoolers will be whisked away on magical culinary adventures in Nickelodeon’s brand-new CG-animated series, Butterbean’s Café, premiering Monday, Nov. 12, at 1 p.m. (ET/PT), in the Nick Jr. preschool block. 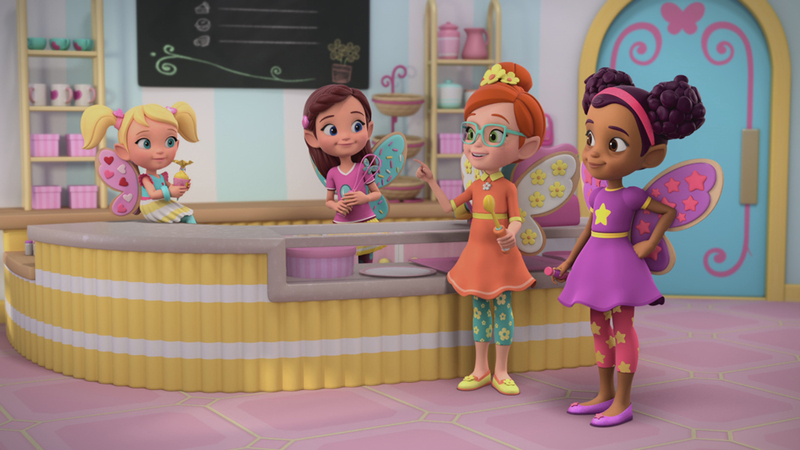 The series (40 episodes), which centers on a fairy named Butterbean and her adventures running her neighborhood café and bakery, will feature guest voice appearances by top celebrity chefs and culinary experts: Richard Blais (Top Chef, Guy’s Grocery Games), Alton Brown (Good Eats, Iron Chef America), Carla Hall (The Chew, Top Chef), Padma Lakshmi (Top Chef), Giada De Laurentiis (Giada at Home) and Rachael Ray (The Rachael Ray Show). Created by Robert Scull and Jonny Belt (Bubble Guppies), Butterbean’s Café showcases creative cooking and features a curriculum with social-emotional lessons that highlight kindness and gratitude, and leadership skills. Following its U.S. launch, Butterbean’s Café will roll out on Nickelodeon’s international channels and branded blocks throughout 2019. In the series, Butterbean, her fairy friends--Dazzle, Poppy and Jasper--and her little sister Cricket take pride in serving up healthy snacks and sweet treats to the residents in their community of Puddlebrook. Butterbean’s special magic beans, the fairies’ enchanted kitchen tools and the team’s can-do spirit all combine to make their cafe the most awesome eatery in town. Leading up to the linear series premiere of Butterbean’s Café, an all-new full-length episode and short-form content are available now on NickJr.com and the Nick Jr. App. In the debut episode, Butterbean and her friends work together to make the café’s first day in business a big success, while competing culinarian Ms. Marmalady (voiced by Alysia Reiner of Orange Is the New Black) attempts to throw them off track. Get ready to be whisked away with Butterbean’s Café, Nickelodeon's brand-new animated preschool series about a fairy named Butterbean and her adventures running a neighborhood café and magical bakery, premiering Monday 12th November 2018, only on Nick Jr. on Nickelodeon USA! Butterbean’s Café is an animated preschool series about a fairy named Butterbean who runs a neighborhood café and magical bakery. She and her fairy friends serve up the healthiest snacks and sweetest treats in Puddlebrook – a small town of fairies and anthropomorphized animals called Brookies. Butterbean’s special bean magic, the fairies’ magic kitchen tools, and the team’s can-do spirit all combine to make their café the most awesome eatery in town, one that’s always much busier than greedy and competitive Ms. Marmalady’s across the brook. That’s because Butterbean has a sure-fire recipe for success – a spoonful of leadership, a dash of entrepreneurial spirit and just a sprinkle of fairy magic! Butterbean’s Cafe features creative cooking, and a social-emotional curriculum that highlights entrepreneurial and leadership skills. The currently confirmed characters in the show are: Butterbean, Keesha, Cricket, Jasper, Ms. Marmalady, Poppy, Miss Honeybook and Reuben. Created by Jonny Belt and Robert Scull, the creators of Bubble Guppies, the series is produced by Brown Bag Films (Peter Rabbit) in Ireland, and is slated to launch on Nickelodeon and Nick Jr. channels around the world soon. Update (10/15): To celebrate the upcoming launch of Butterbean’s Café, Nick Jr. has digitally premiered a full episode from Nickelodeon's brand-new animated preschool series, which you can watch here on NickJr.com's all-new Butterbean’s Café show page! Titled "Fluttercakes! "/"The Perfect Picnic!" (#103), Ms. Marmalady won't let the garbage man empty Butterbean's dumpster unless she beats her in a pancake-making contest! On NickJr.com's new Butterbean’s Café show page, you can also find out more about the show and watch the show's official theme song! Watch the Butterbean’s Cafe theme tune in English here and German here, plus watch a sneak-peek of Butterbean’s Café here! People: Allie Strawbridge, Alysia Reiner, Caitlin Hodson, Chris Phillips, Gabriella Pizzolo, Gillian Higgins, Jean Herlihy, Jonny Belt, Kari Wahlgren, Kirrilee Berger, Kora Gursoy, Laura Kleinbaum, Lorraine Morgan, Lucas Mills, Margaret Ying Drake, Mark Salisbury, Michael Kaufman, Olivia Manning, Rini Soemarwoto, Robert Scull. Get ready to be whisked away by Butterbean’s Café, a brand-new Nickelodeon series coming soon! 🍳 Catch a sneak peek of this tasty new show featuring a friendly fairy named Butterbean, her spunky little sister, Cricket, and the rest of the Bean Team; Dazzle, Poppy, and Jasper. Kids are invited into Butterbean’s Café, a very special place where magic is always on the menu—along with the healthiest snacks and the sweetest treats. Butterbean’s recipe for success combines a spoonful of leadership, a dash of entrepreneurial spirit, a heaping helping of teamwork, and a sprinkle of fairy magic. 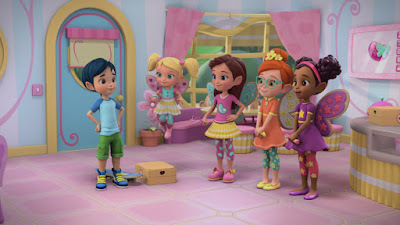 From the creators of the hit preschool show ‘Bubble Guppies,’ comes this magical new animated TV series that is sure to excite and delight both girls and boys alike. Butterbean’s Café follows a social-emotional curriculum, modeling the importance of friendship, teamwork, leadership, and problem-solving skills. Let’s get cooking with Butterbean’s Café, coming this November, to Nickelodeon! Kirrilee Berger of Teaneck, 19, will star on Nick Jr.'s "Butterbeans Cafe." 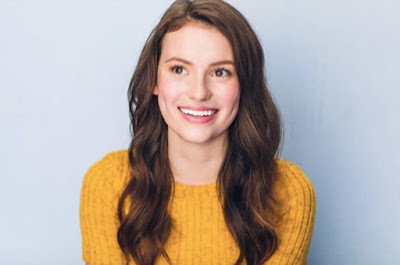 The 19-year-old will be playing Poppy -- the no-nonsense café chef and head of the kitchen -- on Nick Jr.'s Butterbean's Café. The show premiers Monday, Nov. 12, at 1 p.m. and centers on Butterbean, her friends and her sister, who take pride in serving up healthy snacks and sweet treats to the residents in their community of Puddlebrook. Originally published: Friday, October 12, 2018. Follow NickALive! on Twitter, Tumblr, Google+, via RSS, on Instagram, and/or Facebook for the latest Nickelodeon Preschool, Nick Jr. and Butterbean's Cafe News and Highlights!